If you make it to Explore on Flickr, it is a really big deal. It finally happened for me with this photo. Found out today it was #381 in Explore on 1/13/2009! 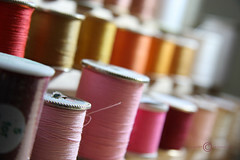 BTW, this was one of many shots I took of my spools of thread sitting on a spool rack. I have them lined up, somewhat by color and mostly the large ones on the ends. Of all the shots I took, this was the only one I even liked. Thanks to everyone for helping me "get on the map" so to speak. Excellent framing of the shot, nice colors, a good tactile sense to it. Congratulations! Beautiful! I love the soft colors. Awesome news Judi! Congrats! Love the softness of the color. I like the colors and DOF. Yay for you and your photography!